Niki gave some of her sporting memorabilia to the new gallery space and attended the Official Opening of the New UOW Sports Hall of Fame #ThisIsUOW event. "It is an honour to be acknowledged as part of the history of the University. I have very fond memories of my time there and it played a huge role in both my academic and sporting development. It was also a wonderful opportunity to work with the The Curators Department who did an amazing job of putting the pieces together." The Curators Department; collaborated with the University of Wollongong and ADM Architects in the re-development of the University's Recreation and Aquatic Centre. "Indulging our interest in finding new ways to engage audiences with archives, we will design and curate a new space for sporting excellence, extending the model of a Hall of Fame. The dynamic new space will incorporate both historical material and new media in innovative ways to celebrate the athletic achievements and participation across the history of the University of Wollongong." "Sporting fever has hit UOW, with the UOW Sporting Hall of Fame launch. The UOW Sporting Hall of Fame was officially opened by UOW Vice-Chancellor Professor Paul Wellings, CBE, and features a wide range of sporting memorabilia from UOW students past and present. Executive Director of the UOW Recreation and Aquatic Centre, Paul Manning, said the new display celebrates excellence in sport, participation and connections to the community through sport. “UOW enjoys a proud history of sporting excellence and we hope to celebrate, inspire, and educate through the many inspiring stories of students excelling in the sporting arena,” Mr Manning said. 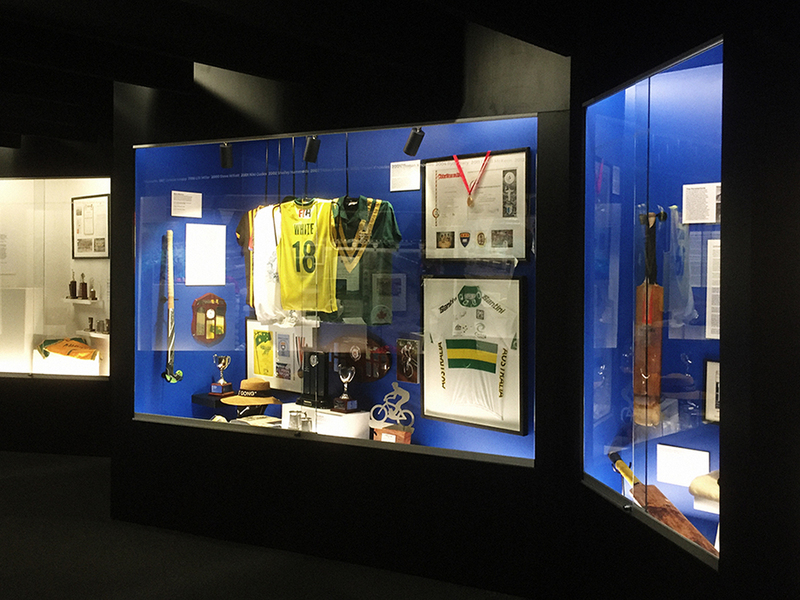 Highlights of the display items include a 1988 bobsled race suit and Winter Olympic uniform from Australia’s first ever bobsled team, a signed hockey stick from Rio-bound athlete Tristan White, medals from the 2003 World University Games and a number of cricket bats and trophies. The display will be updated periodically with photos, uniforms and various sporting artifacts."